Looking for a flavourful soup that will fill your belly? Hearty Kale and Sausage soup will get the job done. It is a fall family favourite and I often have to make a double batch. I use my large stock pot so I can have some left over to pop in the freezer for grab and go meals. Kale is a late season super star and can still be found growing in the garden well into December in my part of the country. This soup was adapted from a recipe I found while doing my monthly freezer meal planning. 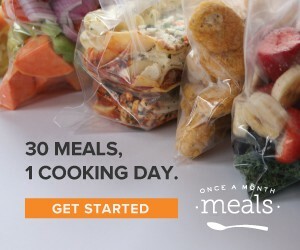 Once A Month Meals is an all in one freezer meal planning website that I subscribe to and adore. Membership has benefits, you can choose from fresh new curated menus every month or design your own. All the work is done for you, from the grocery lists to the prep day instructions and nutritional information. If you want to check it out use my affiliate link and let me know what you think! Using coconut milk for added creaminess gives this soup a rich taste but still counts as paleo friendly. I prefer to load the pot with extra veggies and lots of hearty kale , it will cook down and no one will guess just how good it is for them. My other tip is to use a low sodium chicken broth , I like to use Epicure Chicken broth which comes dry and gets added to water, 1 teaspoon per 1 cup of water. Look for the tip at the bottom of the recipe to make this soup a grab and go meal. A hearty soup that fills the tummy and warms the soul. Packed full of kale and meaty sausage with coconut milk for added creaminess and paleo friendly. Add olive oil, carrots, celery, leeks, garlic and sausage(removed from the casing) and saute togther until sausage is lightly browned and cooked. Add chicken stock, Italian seasoning, sea salt, pepper and coconut milk to the stock pot. Increase to medium high heat until it begins to simmer. Reduce heat to medium and stir in kale. Cover and simmer for 20 minutes. Freeze leftovers in single serving portions for a quick grab and go meal for school lunches or work. Just thaw, heat and eat. We are on a soup kick in our home. Loving the addition of coconut milk – one of my favourite ingredients. I was so surprised at how much flavour was added by using coconut milk! It is a new favourite ingredient of mine now too! Kale is one of my favourite additions to soup because it retains its great toothsome texture (as long as you don’t cook it too long)! 🙂 Great looking recipe! This soup looks so good! I love the idea of once a month meal planning. It just makes sense because you get to know whats in your food… unlike frozen meals from the grocery store! I think I still have Kale growing in my back yard actually… it’s a wonderfully hearty green! I may just make this soon! Thanks Jared 🙂 Don’t you feel so good when you can make food with ingredients that are home grown. I hope you enjoy the soup.